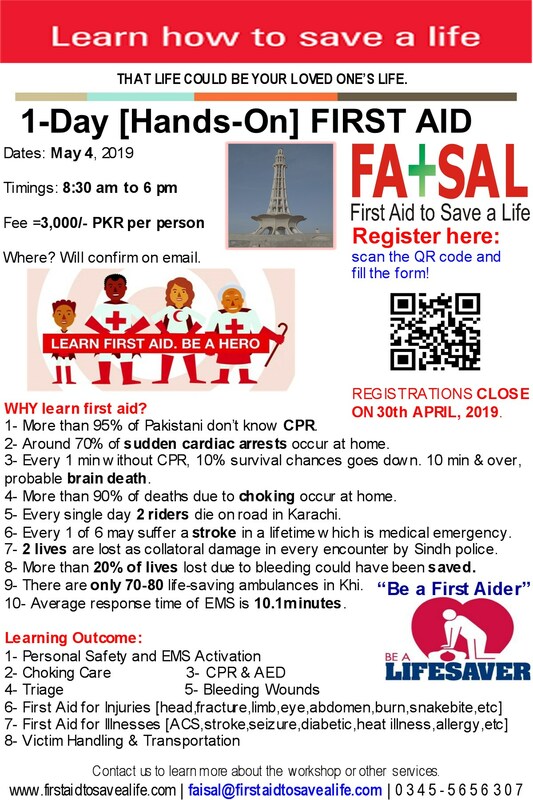 FATSAL is pleased to announce series of CPR and Choking Care Workshops in Karachi in the month of April to raise awareness about cardiac emergencies and train people in CPR and anti-choking skills to save lives. These workshops are open for ages 15 & over. Pre registration is must. There are 3 sessions each on April 22 and 23. A complete workshop worth only 2-hours. Only 20 seats in one session. This entry was posted in CPR and AED, CPR and AED Manikins, Workshops, World Heart Congress, World Heart Day and tagged 2 steps of CPR, 2019, Abdominal Thrusts, ActFastMedical, Adult Child Infant CPR, adult cpr, anti choking trainer to teach choking care, anti choking vest, anti-choking care, anti-choking trainer, basic life support, become a lifesaver, blended cpr training programs, BLS, BLS Course, cardiac emergencies, Cardiopulmonary Resuscitation, care to relieve choking patient, Child Anti-Choking Technique Abdominal Thrusts Heimlich Maneuver, child cpr, choking care, CO-CPR, Community CPR courses, community lifesaver, community of lifesavers, Community responders, CPR, CPR 2 steps technique, CPR and students, CPR certified, CPR for community, CPR for families, CPR Hands On Practical Experience, CPR learn to save a life, CPR learning by doing, CPR learning links, CPR practical training, CPR practitioner, CPR qualified, CPR responders, CPR save a life, CPR save lives, CPR saves life, CPR trained, CPR volunteers, CPR workshop, cpr workshops, CPR Workshops in, CPR Workshops in Balochistan, CPR Workshops in Hyderabad, CPR Workshops in Islamabad, CPR Workshops in Karachi, CPR Workshops in KPK, CPR Workshops in Lahore, CPR Workshops in Pakistan, CPR Workshops in Pakistan in 2018, CPR Workshops in Pakistan on Restart a Heart Day, CPR Workshops in Pakistan on World First Aid Day, CPR Workshops in Pakistan on World Heart Day, CPR Workshops in Punjab, CPR Workshops in Quetta, CPR Workshops in Sindh, CPRsaveslife, first aid and law, first aid law in pakistan, HAINES, haines recovery position, hands on cr, Hands-on CPR training, hands-on training, Hands-Only CPR, heart, heart health, Heimlich Maneuver, how to relieve choking person, how to use anti choking trainer, infant CPR, Learn CPR save lives, life saving skills, Lifesaver, lifesavers, lifesaving skills, local first aid course, make your promise, make your promise on world heart day, medic first aid, medic first aid international, My heart your heart, nation of lifesavers, national first aid course, not for profit workshops, not for profit workshops in Sindh, October, Practical CPR training, reasons children may need cpr, save a life be a hero, SCA, SDG, SDG 3 Good Health and Well-being, SDG Good Health and well-being, SDG11, SDG11 Sustainable cities and communities, SDG3, Sustainable Development Goals, Sustainable Development Goals 11, Sustainable Development Goals 3, The reasons to learn CPR, trainings, trainings in karachi, what are two steps of CPR, what is QCPR, what is SCA, Why learn CPR, why parents should learn cpr and choking care, Workshops in Islamaabd, Workshops in Karachi, Workshops in Lahore, Workshops in October, Workshops in Pakistan, Workshops in Rawalpindi, Workshops in September, world heart congress, world heart day, world heart day 2018, World Heart Day and Heart Talks, World Heart Day and Heart Walks. Bookmark the permalink.